Mellow Velo came out of the SPOKES Weekend Group, which, in turn, was an offshoot the SPOKES Events Group. 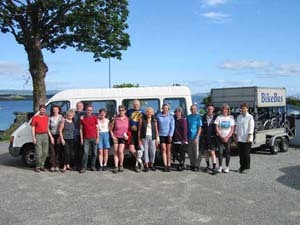 A number of commuter cyclists from Edinburgh who had enjoyed the first Edinburgh to St Andrews cycle ride in 1981 decided to organise a programme of weekend rides based on overnight stays at youth hostels and getting the bikes out of Edinburgh on the train. The first ride in the early 1980s took in Stirling and Loch Ard Youth Hostels and a ride round the car free road by Loch Katrine. Each weekend ride was planned by a "chiefie" for the weekend who planned the route, booked the hostels, took bookings and nobbled somebody to organise the evening meal. A wide range of routes in Scotland and the north of England were identified and explored and many of these are written up in Harry Henniker's book "101 Bike Routes in Scotland". After changes in the policy on bikes on trains made it difficult for groups of cyclists to travel in this way, Harry set up his Bike Bus and this was used for many weekend trips until the end of the 2004 season. Although Mellow Velo is separate from SPOKES, a cycle campaigning organisation based in Edinburgh, many of its members are strong supporters and are also active in organising the annual Edinburgh to St Andrews Bike Ride.